Best WordPress Performance Tuning – Get under 2-second load times on shared magnetic hosting with free plugins and themes. PagePipe speed services uncover real speed problems fast. And we discover unrealized speed potential, too. Many web problems aren’t necessarily the ones you suspect. It’s often something else. Learn the speed truth. PagePipe’s speed techniques are counterculture and unconventional. We only focus on the 20 percent of site features that cause 80 percent of speed damage (Pareto’s Law). Speed is an area rampant with web myth, unproven plugin habits, and Google dogma. We challenge and test those misbehaviors. Speed problems are more often from site owner’s whims and muses. You must stop adding unnecessary and unwanted features. Let go of ideas simultaneously ruining performance and profitability. We help you make wise speed decisions. We show you how. We like helping but … we’re not a bottomless pit of charity. We have limits. We can’t rescue a site if performance goals are unreasonable, unattainable, or impossible. There’s no miracle speed performance without sacrificing something you love. If you’re in love with your site or how you do things now, you won’t like what we’ll tell you. We don’t sell *curative placebos* that never speed up your site. We cater to worst-case web performance scenarios. We optimize content at the origin on commodity hosting. Surrounding poorly optimized content with third-party CDN or caching services doesn’t guarantee success. Origin optimization is our first priority. Cost-benefit analysis for page load speed is an important exercise. Are you committed to delivering the best performance possible to your readers? A site bloated with codes and scripts, especially external ones, can only load so fast … and there’s only so much that’ll speed it up. Loading only what readers need is the best performance enhancement. We help you determined that and optimize it. Dumping whimsical or random stuff on your site ruins speed. Performance-fairy dust won’t magically deliver sub-second page load speeds. When your site has too much going on, it’s time for value analysis. Clean themes and the judicious use of plugins are key. The single most effective solution to fix a slow site is keep what you need and jettison the rest. Don’t rush to use advanced components before taking care of basic needs. We strip themes and WordPress to reduce WordPress bloat. We substitute poorly designed popular plugins with leaner alternatives to improve performance. Pushing slow assets out to a CDN or caching service is a bad solution. That annual overhead is best spent on building a more optimized vital origin. Slow-loading sites pull scripts from someone else’s network. These include advertising scripts, website analytics scripts, web fonts, and social sharing scripts from Facebook and Twitter. And more, of course. These scripts are on very powerful networks and CDNs accessed by billions of users. They load slower than objects delivered from your site. There’s NO magic potion to throw at third-party scripts. The only solution is a good ol’ cost-benefit analysis. If the profit benefits of third-party scripts outweigh their cost on your load time, fine. Keep them. If not, get rid of them. Is tiny ad profit slowing down your site? We analyze your site and streamline it. We keep the objects you need. We consider with a skeptical eye those you merely want. And ditch what nobody uses – nor even sees. Focus on the fundamentals – optimize your origin – before you look anywhere else. WordPress is open source. People start with nothing more than a $5 website hosting plan. There’s a low-entry cost to the world of WordPress. It’s coupled with the availability of free WordPress themes and plugins. Many WordPress users feel entitled to get everything free of charge. 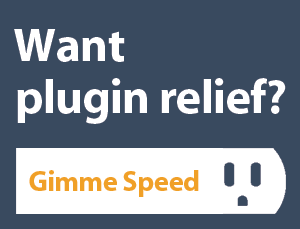 We’re advocates of free themes and free plugins for speed. And low-cost shared hosting. These are good enough when you build a strategic site with speed goals. Are 60 to 70 percent of your traffic on smartphones and tablets? The goal is often a desktop load time of under 2 seconds. This translates into around 4 seconds in a Starbucks parking lot. The goal is improving user experience (UX) – not search engine optimization (SEO). The notion of speed improving SEO (page ranking) is a falsehood or web myth insinuated by Google. Tests show that speed affects SEO less than 1 percent. You need speed strategy and value analysis. Speed is about user experience. Speed is an indicator of site-owner hospitality and website quality. Load-time or page speed is NOT an influencing factor in Search Engine Optimization. That’s a myth and even a deception. Regurgitating web propaganda doesn’t enhance our credibility as a performance optimization company. Stop the speed myths. The biggest players on the Internet make untrue statements about speed. Hosting and CDN service providers falsely boasting stellar performance and security benefits. Providers like SiteGround, FastComet, GoDaddy, Cloudflare, and WP Engine – but there are many more. It’s a long list. Deceptive online speed tests like Google PageSpeed Insights, Pingdom, GTMetrix, or WebPagetest.org (also a Google property). We love these tests and use them. But they tell us to fix stupid things making no difference in speed – only scores. Better scores are meaningless. Wasteful. Lazy authors and resellers of bloated, heavy themes like Divi (1-second load time). For comparison, a free default theme is often under 50-milliseconds load time. (WordPress core loads in around 100 milliseconds). Which theme do you think has the shortest shelf life? Apathetic authors and resellers of plugins. Most plugins cause global loading on every page and post of your sluggish site. That’s site drag. Plugins then load scripts whether they’re used or not – everywhere. This is a hidden, unpublished speed liability. Good coders make plugins that don’t slow down pages. Who are the worst offenders? Oddly, the most popular plugins with millions of downloads. Plugins such as Yoast SEO, Contact Form 7, and Wordfence Security. The more *essential* the plugin the worse the site drag. Even popular paid SPEED plugins like WP Rocket slow down pages globally by 45.3 milliseconds. Plugin authors neglect mentioning site-drag specifications – a sin of omission. And the big fish: Google experts claiming speed makes an absolute SEO difference. Do these speed people lie? No. We don’t think so. Do they zealously exaggerate? Often. They’re caught up in a self-created technological tornado. It’s cognitive dissonance. That’s where you accept as truth what reinforces your existing belief – no matter how twisted. Not facts. Stories that amplify propaganda. Trusting unsubstantiated web gossip is most absurd. But it happens every day. These self-proclaimed credibility sources can’t stop spinning. Some accept ivory-tower experts proclamations and ideology. Others follow The Blind Herd of fashionable web speed myths. And jump without questioning. Lemmings. How can you know what’s speed truth or error? Is the pervasive problem of speed deception that terrible? Do you need to fix it? Yes. You do! Fight the urge to swallow what others tell you about speed. And even more, be suspicious of implications there’s a penalty for non-compliance. Don’t trust speed predator’s doom-and-gloom predictions. They want you afraid. Anxiety motivates sales of speed services and products. WordPress performance optimization services brag about improving site speed. We’re sorry. 7-second to 4-second load times still aren’t good enough improvement. Yes, it sounds good. And it’s a measurable improvement. But a 4-second page load is still a flop. Now, if it was 10 seconds reduced to 1 second – or even 2 seconds, we’d be mighty impressed. But 4 seconds isn’t best practice for user experience. If someone claims speed improves SEO. They’re misinformed – or a snake-oil conman. Scores don’t count – millisecond load times do! Surprise! Google doesn’t really care about speed. They say they do, but reality says otherwise. They don’t walk the talk. Every web service they provide slows down web pages – Google Ads, Google Fonts, Google Maps, Google Analytics, Google reCaptcha, Google-mandated SSL certification, etc. Who are they kidding? Those are some of the worst speed culprits for slowing down the web. Increasing your Google PageSpeed Insights test score from 50 to 86 is no guarantee of anything. Really. It’s not scoring that count. Anyone can trick a speed test score with trivial changes. Do speed scores affect SEO? You wish! There’s no compelling evidence. Load time in milliseconds and page weight in kilobytes are what counts. Not a colorful green flag – or arbitrary numerical score. That applause is artificial and fabricated to help you feel good about vain efforts. Test performance criteria (the measuring stick) is based on “theoretical speed principles.” Those egghead opinions don’t make much difference in real-world user experience. Load time in milliseconds and page weight in kilobytes are what count. Where did these “speed scores” originate? Steve Souders coined the term web performance optimization in 2004. Souders worked at Yahoo on the Extreme Performance Team. He helped invent the Yslow speed test. How did his speed philosophies migrate to Google? They pirated him over to the dark side in 2008. There he helped determine the PageSpeed Insights criteria. Does he still work at Google? No. But his legacy of obsessive-compulsive speed doctrine lives on. He’s not evil. We like him. But he left a residue (scores) that’s still accepted as truth even though outdated and obsolete. The web moved on. Souders now works at SpeedCurve testing the interplay between performance and design. Ivory tower is a state of privileged separation from real-world practicalities. Guaranteeing SEO ranking based on an achieved Google PageSpeed score is ludicrous! Don’t be fooled. Speed affects Google page ranking less than 1 percent. What improves your SEO most is offering something people value. That’s relevant content and good user experience. Those things you can control. Unless you’re selling irrelevant rubbish. Then nothing you write is relevant. Nothing can save a valueless offer. Relevant content directly, and indirectly, move the SEO needle. Not hollow speed scores. How much do promises of miracle speed cost? About $100. That’s the usual pond-bottom, scum-sucking price tag. What do you get for parting with your green Franklin? Well, it sounds technical and complicated. But the benefits listed are *coincidentally* identical to specifications for the paid WP Rocket plugin. Shocking. They install that plugin and enchantment – done. Results? Good score – maybe. Good speed? Not necessarily. They didn’t promise a load time, did they? Not for $100. Only a feeble irrelevant score. Fix your site speed problem without shelling out for the recurring expense of annual plugin or theme rent. You can install free alternative plugins instead. We test alternative plugins. They work. It won’t cost you anything to test them for yourself either. But what if you don’t have the time or the technical mental energy to make these changes yourself? What if you’re too busy counting your money? Nice. Hire us to help you. Not those other guys. Hypocrisy! Didn’t we say not to spend money on speed parasites? But we’re not leeches or bloodsucking lampreys. Not everyone’s fanatic about speed optimization. We’re busy people, too. We’re not operating a 100-percent charity organization to save the Internet. If you want us to repair or rebuild your site, we’ll oblige. But we want you to understand what exactly you’ll get and why it’s important first. We don’t sell boilerplate speed tricks you don’t need. If you want to reduce your pain of making speed improvements, we’ll help. We’ll even teach you skills. Then you won’t need us again. Self-inflicted obsolescence. We recommend changes. You approve them. We then do it. We benchmark before-and-after improvements. Previous PostPrevious Image rotation using plugins for site efficiency. Next PostNext WPFaster.com: 10 speed changes for $1,985. DIY with free plugins.